There are so many ways to cook chicken in the slow cooker and make easy weeknight meals. 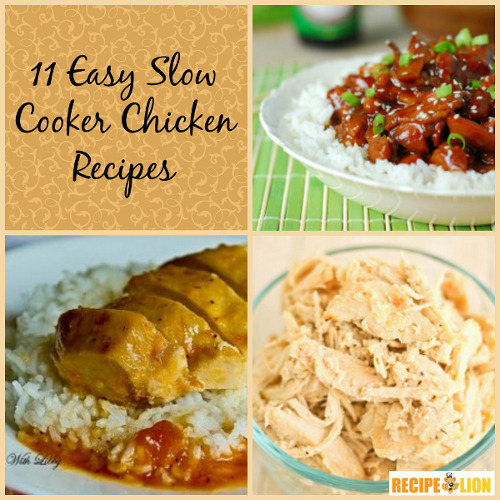 This list of 11 Easy Slow Cooker Chicken Recipes is chock-full of all of the best slow cooker recipes on the internet. These hand picked recipes will be just what you need to break in your new slow cooker. Don't cook the old fashioned way - learn the art of slow cooking and make dinner a breeze from now on! We found everything from traditional chicken recipes like barbecue chicken to more unusual chicken recipes like salsa chicken. When you serve these amazing recipes, everyone will think you've been working hard in the kitchen all day. It can be your little secret that you actually just threw the ingredients into the slow cooker and went about your day as usual. Most of these recipes take 6 to 8 hours, so you don't have to worry about your dinner while you're at work or running errands. You're going to want to save these recipes because they are great to have on hand all year long. Enjoy them with your family and friends as soon as possible. 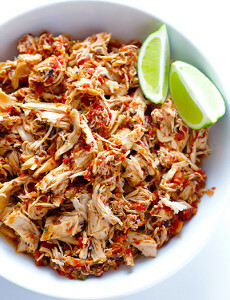 You'll be won over by these slow cooker chicken recipes in no time! If you want more slow cooker recipes, check out our free eCookbook of 21 Meaty Slow Cooker Recipes for Dinner! You'll find slow cooker recipes for all of your favorite types of meat. Best Slow Cooker Rotisserie Chicken - This recipe tastes just like that classic grocery store rotisserie chicken. You can put it in anything, including soup, salads, or sandwiches. "Fried" Chicken - This great slow cooker chicken recipe involves blackening your chicken before slow cooking it to make it nice and tender. The result is an absolutely fantastic chicken dish that the whole family will love. Barbecue Slow Cooker Chicken - There is nothing like good slow cooker barbecue and this recipe teaches you just how to do it right. Set this recipe a-cookin' and spend the day not having to worry about dinner. Slow Cooker Italian Chicken - This fantatsic chicken and vegatable recipe is full of nutrients and flavor that will feed your whole family. Cook it up today and you'll enjoy that great flavor. 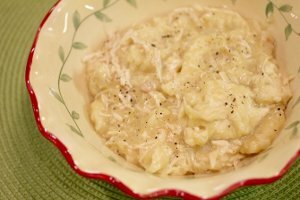 All in One Chicken and Dumpling Supper (shown) - This is a fantastic, hearty weeknight meal that will satisfy the whole family. When you need a one-dish meal, this should be your go-to recipe. Don't stop with these recipes! There are plenty more easy weeknight dinner recipes in our collection of Dump and Go Dinner: 21 Easy Weeknight Dinner Ideas. Apple Butter Barbecue Chicken Sandwiches (shown) - This slight twist on your favorite pulled chicken barbecue sandwich is a delicious recipe for any family dinner or barbecue. All-Day Honey Sesame Chicken - When you're craving Chinese take-out but don't want to spend extra money, check out this recipe. It's even more delicious than the restaurant version! 4-Ingredient Dump and Go Russian Chicken - This is a flavorful all-day chicken recipe that's perfect for busy weeknights. The ingredients are so simple that you barely have to plan ahead! 2-Ingredient Salsa Chicken (shown at top) - Yes, that's right, this recipe only has two ingredients! You can choose your favorite salsa to customize this recipe to your preference. Amaretto Chicken - With delicious curry and amaretto flavor, this slow cooker chicken recipe is great with rice. With six hours of cooking time, you know this dish will be nice and tender when it's ready. Chicken Chop Suey - Make this Chinese restaurant staple right at home in your slow cooker. Forget Chinese takeout, bring it in and cook it up with more ease than you thought possible. Fantastic!